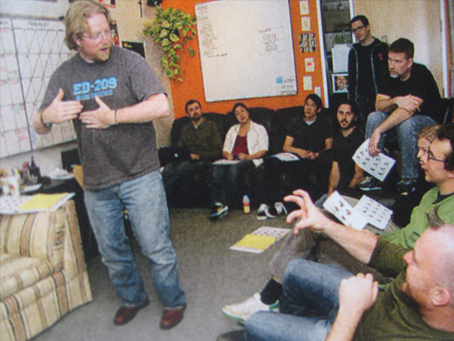 Writer and director Andrew Stanton wearing our limited edition ED-209 T-shirt in the production of the computer-animated adventure/comedy/science fiction masterpiece… Wall-E.
“It’s a movie geek’s oasis. So glad to see new additions to the catalog too. And I love wearing them to Pixar (a movie-geek Mecca) to see who is worthy of making the connection of the t-shirt logo w/ the movie. Thanks for such a great site.” Andrew Stanton.